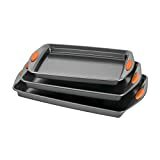 Calphalon Nonstick Bakeware, Baking Sheet, 12" by 17" is currently selling at $19.99, which is its normal price. It has a lowest price of $19.99 and is selling within its usual range. Price volatility is 0.15% (meaning it does not change often), so you might have to wait a while for the price to drop. Until then this is a recommended 'ok deal'. The current deal is also the best price on this item over the last month. 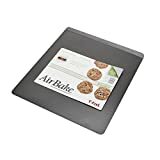 Compare the current price, savings (in dollars & percent) and Buy Ratings for the top Baking Sheets that are closely related to Calphalon Nonstick Bakeware, Baking Sheet, 12" by 17". Here is how Calphalon Nonstick Bakeware, Baking Sheet, 12" by 17" compares with other leading Baking Sheets. With a large baking surface and raised edges, you can use this jelly roll pan to bake everything from cookies to sheet cakes. Edges ensure that your baked goods won't slide off when removing from the oven. Furthermore, any juices from jelly rolls, strudels or calzones won't spill over the sides, making a mess of your oven. Calphalon Nonstick Bakeware has interlocking nonstick layers to deliver high performance release. In fact, baking pans release up to 2 times better than Calphalon Classic Bakeware. 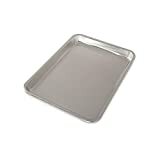 Now, even the stickiest baked goods can be removed cleanly for beautiful results and easy cleanup FeaturesHeavy-gauge steel core won't warp and heats evenly without hot spots so your cookies and cakes come out of the oven perfectly and evenly browned.The interior of each baking pan has interlocking non-stick layers that are designed to deliver long-lasting, high-performance release. 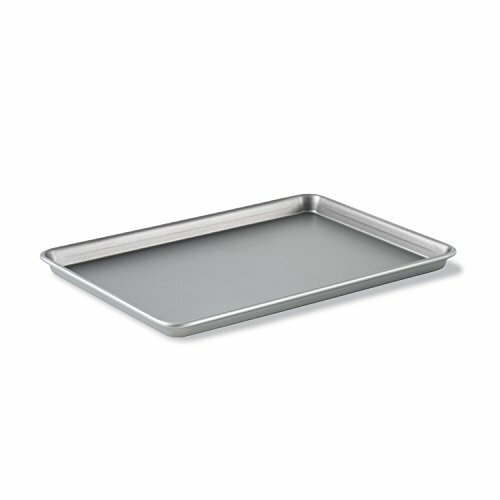 Releases up to 2X better than Calphalon Classic Bakeware.Nonstick finish is beautiful and practical.Large baking surface and raised edges let you use this jelly roll pan to bake everything from cookies to sheet cakes. Edges mean baked goods won't slide off and juices won't spill over the sides.